The principality of Moldavia was located in what is now Romania, Moldova and Ukraine. At its peak, it reached from the Dniester River to the Siret River and from Bukovina to the Black Sea. The principality emerged as a distinct and independent principality in the mid-14th century. By 1512, it was a part of the Ottoman Empire and the object of occupation by Russian forces for parts of the 18th and 19th century. In 1812, Bessarabia was acquired by Russia, but southern Bessarabia was restored to Moldavia in 1856 under the Treaty of Paris. Moldavia merged with Wallachia in 1859 and the name Romania was applied to the country in 1862. We have very little information on ancient Moldavian and Wallachian flags. For Moldavia the most important symbol has always been the wild ox head, which is still to be found on the flag of the new Moldavian republic (Moldova). 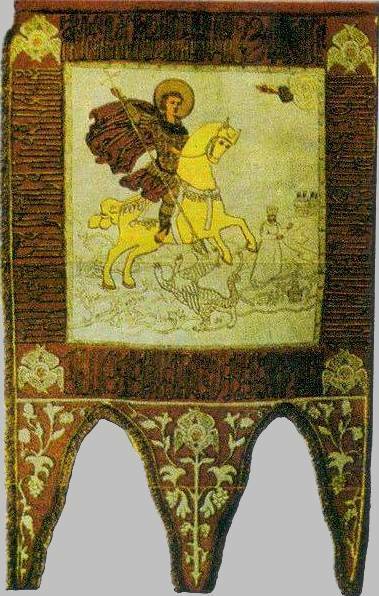 In early times the red prevailed on other colours: on standards, the wild ox head appeared on the recto, while the verso represented St. George killing the dragon. It seems that this standard was adopted by Bogdan I and maintained by Stephan the Great and successors. In the following century (XIX) the blue was added. According to an 1813 document, under prince Scarlat Calimachi the princely standard was red, yellow and blue on the recto (without any symbol), while on the verso was St George riding a horse on a blue field. Another document, dated 1814, again reports a red standard. Michael II Sutu (1819-21) had a blue flag with the wild ox head on the recto and red with St George the verso. The two Moldavian flags above from the XV-XVI c. are in Bucharest museum. The earliest information regarding the color of the Moldavian flag (including the elements of it) comes from a book of documents published in Krakow in 1533: "The grand flag had a red field on which was nicely painted with gold the coat of arms of Moldavia" ("banderim magnum sericeum, coloris rubri, in quo arma terrae Moldaviae pulhre auro depicta erant"). Another flag of Moldova is one during the reign of prince Ieremia Movila (1595-1600, 1600-1606), a flag captured by Prince Michael the Brave in 1601. This, among with 109 others was sent to the Holy Roman Emperor Rudolph II. All these flags were painted by an Austrian artist in a manuscript found later in Landesbibliotek from Dresda. The flag of Moldavia is shown above. It is rectangular, proportion ca. 7:12, red, with a golden border. In the middle, the argent coat of arms of Moldavia: an aurochs head, with an 8 pointed star between horns and two crescents above the ears. The coat of arms is surrounded by an argent circle with a cross on top. In the canton, on an argent field, with black Cyrillic letters, is written the title of the prince (in Old Church Slavonic) and the year 7109 (that is 1601 AD). Gules, an aurochs' head Or with a five or six-pointed star between its horns, a rose at dexter and a crescent at senester, all Or. a portret of the Moldavian prince Aron Tiranul, painted in 1594 at Budapest, shows a shield Azure, a buffalo's head in natural colors (reddish-brown) with a star Gules between its horns. a heraldic work of J. J. Chifflet, published in 1594 in Antwerp, shows a shield Argent, a buffalo's head Sable with a star Or between its horns. a heraldic work of Simon Okolski, published in 1643 in Krakow, shows a shield Argent, a buffalo's head Sable with a six-pointed star Argent between its horns. In the XIXth century it seems that the coat of arms had a shield Azure, an auroch's head Or/Argent with a star between its horns, of the same metal. The shield is supported by two dolphins Argent, affronts, head down. Sometimes the shield was divided per pale and one half contained the coat of arms of the prince. Another inovation of the XIXth century was the introduction of the mantle Gules lined with Ermine, with a princely crown above. The coat of arms, representing an aurochs head, can be found on every official seal, e.g. An XVth century engraving, representing the Battle of Baia (1467), made by I. Kukullo in 1488, shows a long triangular flag with red (?) stripes. Near the hoist, a head of aurochs, Or (?). The exact colors could not be determined, because the original engraving was black and white, and the colors were added later. Different copies of this engrave have variations of colors (for example this one). The Romanian heraldists Dan Cernovodeanu and Jean Nicholas Manescu believed that the flag contains the Moldavian heraldic bars: Or and Vert. In this case, the flag would have been hoisted vertically, as other Moldavian war flags of the time, and the aurochs' head, mistakenly engraved as paralel with the rod, would have been perpendicular, over the bars. An engraving representing the Battle of Obertyn (Sep. 22, 1531), made by Marcin Bielski in 1564, shows a long triangular flag with an aurochs' head near the hoist. The aurochs is flanked by a crescent at senester and a six-pointed star at dexter. In this engraving there can be seen another Moldavian flag with a big cross on it. The Moldavian chronicles mentions that the Polish Army captured "the big flag of the entire Moldavia with the aurochs' head and a star between its horns, the flag of Suceava county and other smaller flags". It seems that Bielski's engraving confounded the rose at dexter with a star and omitted the star between the auroch's horns. Other Moldavian war flags have religious subjects on them and resemble closely to the Orthodox Church flags. One of them is rectangular and realized by the technique of embroidery with golden, silver, white, red and green silk on cherry-coloured (initially red) Indian satin. Dimensions: 120 x 90 cm. 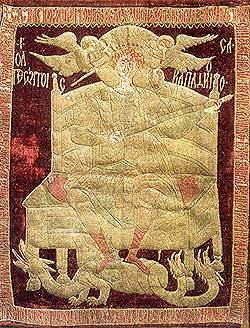 In the middle of it stands Saint George of Capadoccia on a throne, slaying the dragon. Two angels bring him gifts: the right one a sword, the left one a shield with lots of precious stones. Both of them put a crown on the saint's head. This religious depiction is bordered by an inscription in Church Slavonic: "Oh, patient and victorious one, great martyr George, who, at trouble and needs you are a sudden defender and devoted help, and great joy to sad ones, please accept the supplication of your humble servant, prince Io Stephan Voivode, by God's mercy hospodar of Moldavia, and keep him unharmed in this life and the other one, with the prayers of those who honour you, so we can praise you forever, Amen! Made in the year 7008, and of his reign the 43rd." (in Romanian, for perhaps a better future translation: "O, indelung rabdatorule si de biruinti purtatorule, mare mucenice Gheorghe, cela ce la nevoi si in napaste esti grabnic aparator si fierbinte ajutator, si celor intristati bucurie nespusa, primeste de la noi si aceasta rugaminte a smeritului robului tau a domnului Io Stefan Voievod, cu mila lui Dumnezeu domn Tarii Moldovei, si-l pazeste pe el neatins in acest veac si in cel viitor, cu rugaciunile celor ce te cinstesc pe tine, ca sa te proslavim pe tine in veci, amin! Si s-a facut in anul 7008, iar al domniei lui anul al 43-lea"). This flag was made during the reign of Stephen III the Great, and send in 1500 (7008) to Zograf Monastery in Mt. Athos. In 1917, with numerous approvals, the flag was going to return into Romania. It was taken first by the Romanian consulate at Salonic and then transported with a French vessel at Paris, where it remained until 1919. In December that year it has been shipped to Bucharest, where it stands today, in the National Military Museum. The second war flag with religious subjects is approximately 100 x 100 cm, excepting the three extensions. It is also made by embroidery on red Indian satin. In the middle, Saint George slays the dragon (on obverse) and Jesus is baptised by John the Baptist (on reverse). The inscription in Church Slavonic bordering Saint George says: "As a saviour of those enslaved and useful to poor ones, doctor to powerless, help to the emperors, oh victorious great martyr George, pray Christ-God to redeem our souls." (In Romanian: "Ca un izbavitor al celor robiti si saraci folositor, neputinciosilor doctor, imparatilor ajutor, purtatorilor de biruinta mare mucenice Gheorghe, roaga pe Hristos Dumnezeu, sa mantuiasca sufletele noastre"). The original flag (or perhaps a copy of it) can be seen here. Constantin Orghidan, Mircea Vulcanescu and Virgiliu Leonte. A red rectangular cloth, with an aurochs head in the middle. The aurochs is flanked by a crescent sinistrally and a five pointed star dextrally and has another, smaller, five pointed star between its horns. The color of celestial heraldic elements is argent, while the aurochs head could be either in natural colors (close to sable) or in argent itself. The monasteries' frescoes also showed that the masthead pennant was usually a long triangular or rectangular, ending in a swallowtail, red cloth. Remarks: A book depicting old Romanian (Moldavian and Wallachian) ships, with some of their ensigns.